Titanium - 22Ti Your user agent does not support the HTML5 Audio element. The five stable Titanium isotopes are used for a wide range of studies and applications. Ti-48 is used for the production of the radioisotope V-48 which is used in nutritional studies and for calibrating PET instrumentation. Ti-47 is occasionally used as an alternative precursor for the production of V-48. Ti-50 is used in the production of super heavy elements whereby Lead or Bismuth targets are bombarded with Ti-50. Finally, Ti-49 is used in the production of the radioisotope V-49. This table shows information about naturally occuring isotopes, their atomic masses, their natural abundances, their nuclear spins, and their magnetic moments. Further data for radioisotopes (radioactive isotopes) of titanium are listed (including any which occur naturally) below. 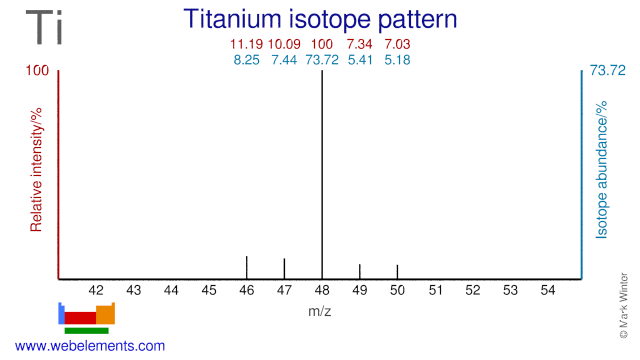 Isotope abundances of titanium. In the above, the most intense ion is set to 100% since this corresponds best to the output from a mass spectrometer. This is not to be confused with the relative percentage isotope abundances which totals 100% for all the naturally occurring isotopes. Further data for naturally occuring isotopes of titanium are listed above. This table gives information about some radiosotopes of titanium, their masses, their half-lives, their modes of decay, their nuclear spins, and their nuclear magnetic moments. Common reference compound: TiCl4, neat.